I SPY's main title was the first in TV history to combine animation, graphics and live-action. First of all, there's What's New, which will keep returning visitors updated on additions to this website. The Stars looks at the distinguished careers of Culp and Cosby, while The Creator explores Sheldon Leonard's contributions, and The Music does likewise for Earle Hagen. The Episodes provide as many details as we can glean on all 82 entries (and will include transcripts and screen grabs, as time goes on.) The Movies looks at the new one starring Eddie Murphy and Owen Wilson as well as 1994's I Spy Returns. There were seven paperback tie-ins penned by John Tiger (aka Walter Wager) and six comic books as well, and we'll examine all those in The Books and The Comics. And then there's I Spy, A-Z which, when completed, will be an encyclopedic guide to Kelly and Scotty's world. Oh, and don't forget The Images and The Awards. If you ever wrote any I SPY fiction then you might want to consider publishing it in The Fan Fiction section. (I am a professional author, and the first stories I ever wrote were inspired by the series.) While you're at it, send a friend or loved one an I Spy Ecard. I Spy was a departure from the traditional type of show about espionage. Both of its leads were realistically conceived characters and could see the humor in situations, enabling them to have fun with their work. It had its share of cloak-and-dagger action, but never took itself too seriously. Comedian Bill Cosby, who provided much of the subtle humor in the show, proved he was an accomplished serious actor and had the added distinction of being the first black performer to have a starring role in a regular dramatic series on American television. Kelly Robinson and Alexander Scott were a team of American agents. The cover used by Kelly was that of a top-seeded tennis player traveling around the world for tournaments. A former law student at Princeton, he had played on two Davis Cup teams. Alexander Scott's cover was as trainer and traveling companion to Robinson. A graduate of Temple and a Rhodes Scholar, his knowledge of languages was often useful in dealing with people all over the world. Both of them were dedicated to government service and America, but their dedication did not stop them from often questioning the motives and purposes behind some of the maneuvers in which they were involved. Their casual approach to life, and job, was a very refreshing contrast to the nature of their work. Filmed on location in such cities as Hong Kong, Acapulco, Las Vegas, Marrakesh, Rome and Tokyo, among others. "The popular NBC network program I Spy ran for three years from 1965 to 1968. Arriving in the wake of the James Bond phenomenon in the mid-1960s, it was one of several American television series of the period whose fantastic plots revolved around matters of espionage. 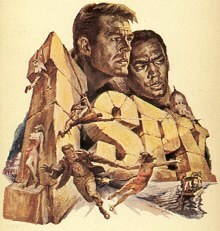 It was the alchemical starring partnership of Robert Culp and Bill Cosby, however, that elevated I Spy to the pantheon of well-loved and well-remembered escapist entertainment, although the duo was supported by scripts that were consistently witty. 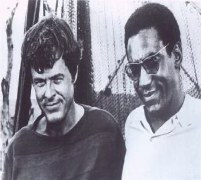 The stars played secret agents, who roamed the world masquerading as a professional tennis player (Culp) and his manager/trainer (Cosby). Cosby thus became the first black actor in American television to star in a prime-time drama as a hero-character on an equal footing with his white fellow actors. Noteworthy, too, for its foreign locations, I Spy was filmed almost entirely outside the United States, frequently in Mexico, in the Mediterranean areas of Europe, and in Asia."